Nowadays, some predict the advent of “World War III”, as they say: “War is coming, it would begin very soon”. But, I say that the actual war is going on. The war I am talking about began since capital started accumulating private profits by exploiting the surplus labour of millions of workers. There is a Marxist saying which is now quite popular in the social media which says: NO WAR BUT CLASS WAR, which summarizes the communist position regarding the question and need of ‘war’. As anti-imperialists, we stand strictly against imperialist wars of annexation which involves extreme greed for making private gain- the thing we, the communists, strongly despise. The Indian working class has been undergoing a long state of oppression and exploitation. The class struggle in India was in motion in everyday reality long before the British invaded our country. Before the capitalist revolution began in India in the hands of the British imperialists, class oppression was a concrete reality that continued in the Indian feudal society which was divided into ‘castes’. The casteist hierarchy is a socio-economic hierarchy based on the unaltering division of labour (It is also the division of labourers, according to Bhimrao Ambedkar, a noted social thinker and activist) in which the so-called “upper castes”, the only “learned” castes, own all the wealth and receive all the privileges whereas the so-called “lower-castes” or “untouchables” (as the parasite upper castes call them) have to work for them and serve them unquestionably; they also have to accept their position as well as their condition to be “inevitable” and “unchangeable”. All this is nothing but a method for preserving governmentality. This led to a state of class conflict because caste is an enclosed form of class, as can clearly be observed. The “untouchables” or lower castes or dalits (oppressed) represent the working-class population of India. Their struggle for freedom, liberty, equality and justice is continuing even today. Under British colonial rule, the Indian workers and peasants, that is, the Indian working class, suffered miserably. Innumerable famines caused by the British land policies led to hundreds of rebellions, including both successful and unsuccessful ones to some extent. Majority of those rebellions were organized by the oppressed people, who were compelled to work according to the demands of the British imperialists. During the middle and the end of the nineteenth century, India saw various peasant rebellions in different parts of the country because of unimaginable economic exploitation (The most significant among them was the Santhal Rebellion of 1855-56, which was led by mighty leaders like Sidho and Kanho. It helped a lot in generating a great amount of hope and courage in the minds of the suffering Indians.) Other than that, what is generally accepted as the “first war of independence” (1857), began just after the Indian sepoys, working under the British, openly disobeyed injustice. As everyone knows very well, that the British rule in India continued for nearly two hundred years, a time in which different changes took place. These changes brought forth an untold amount of suffering and misery for the Indian working class. The introduction of anti-people laws, the barbaric land settlement and revenue policies along with the increasing amount of wealth in the hand of the capitalists made the conditions of the Indian working class awful. This period was mainly characterized by the drain of India’s wealth solely for the private benefit of the imperial “lord”, Britain. To meet this aim, the Britishers inhumanly stressed on the need for the production of cash crops which led to capitalistic commercialization of agriculture, turning land into a commodity. This increased the pressure upon the toiling class, which made their lives more severe. Apart from this major fact, another important fact is the imperialist methods of control which were employed by the British colonialists in India. To divide the working class up, they applied the ‘divide and rule’ policy, which was completely based on political motives but was built intentionally on religious considerations that led to two great partitions, one of Bengal (1905: The Great Bengal Partition) and then of the whole country (1947), in two different decades. These partitions destroyed thousands of innocent lives of the oppressed people who fell prey to imperialist conspiracy. To understand class struggle in the context of India more thoroughly, I must trace its development afterwards under British colonial rule. Let me try to describe the background in brief. From 1925-26 onwards, India saw the advent of millions of workers’ strikes and demonstrations, especially in the major cities of the country (Bombay, Calcutta etc.) that raised the demand for land, bread and peace. This threatened the British capitalists who only believed in earning more and more profits. At this time, they introduced two draconian bills that were aimed towards destroying the growing working class movement in India. The public safety bill (1928) and the trade disputes bill (1927) threatened the solidarity of the Indian toiling masses and the basic principle of freedom. Beside the introduction of these bills, the Simon Commission arrived in India in 1928 with the aim of “introducing constitutional reforms”, as they said. But their real aim was to reserve more privileges for themselves. The British colonialists wanted to strengthen and consolidate their authoritarian power under the guise of the policy of introducing “reforms” in the working of the British administration. The Morley-Minto reforms/Indian Councils Act (1909) and Montague-Chelmsford reforms/Mont-Ford reforms which formed the basis of the Government of India act (1919), were introduced years before the arrival of the all-white Simon Commission and were directed towards the fulfillment of the same aim. Both the above-mentioned anti-people bills along with the strict imperialist attitude of the all-white Simon Commission were strictly opposed by the Indian masses. During the existence of such a revolutionary condition, the bourgeois “national leader” Mohandas Karamchand Gandhi tried to make compromises with the British imperialists and led a so-called “freedom movement” that got continuous praise, support and funds from the capitalists! The reactionary Gandhian Congress movement, based on the so-called “peaceful” methods, provided no help to the working class. This Congress movement led by Gandhi either ended in a compromise or complete failure. On the other hand, the continuance of the exploitative order-of-things by the British colonialists caused a great deal of dissatisfaction in the progressive sections of the Indian society, especially the youth, who believed in direct and revolutionary action. They drew inspiration from the French Revolution (1789), the Italian Revolution (1871), the Russian Revolution (1917) and the Irish revolutionary struggle (1919-1921). The result of this was various revolutionary actions broke out in between 1927 and 1933, including the growing struggle of the socialists and communists who got tried by the British colonial system one after the another: in the Kakori “Conspiracy” case trial (1925-1927), in the Meerut “Conspiracy” case trial (1929-1933), in the Bolshevik or Cawnpur (Now Kanpur) “Conspiracy” case trial (1923-1925), in the Second Lahore “Conspiracy” case trial (1929-1931) and in the trial of the Chittagong (now in Bangladesh) revolutionaries who led guerrilla warfare including a courageous armoury raid against British imperialism in 1930. Among all these socialist revolutionary actions that took place in India, one action still carries a unique and significant place in the country’s history. The immortal slogans “Inquilab Zindabad” (Long Live the Revolution) and “Samrajyavad Murdabad” (Down with Imperialism)” came into existence and got popularized in the Indian political arena after 8th April 1929, the day when the Public Safety and Trade Disputes bills were going to become “laws” through the authoritarian use of the special tyrannical powers vested in the hands of the British Viceroy. That day, the above-mentioned revolutionary slogans were shouted out by two young ‘reds’ (as some of the newspapers identified them) while they dropped two bombs in the British Central Legislative Assembly, Delhi (Now Lok Sabha or the House of the People, the lower house of the Parliament). The bombs were dropped by the Indian socialist revolutionary: Com. Bhagat Singh (1907-1931), who was accompanied by Com. Batukeshwar Dutta. The bombs were completely harmless as they were deliberately thrown in the empty spaces of the assembly to avoid any sort of injury or bloodshed. The aim of the assembly bomb action was “to make the deaf hear”. A long time has passed since then. India has achieved POLITICAL FREEDOM on 15th August 1947, with the efforts of the Indian naval soldiers and the revolutionary Azad Hind Fauz (Indian Independence League) led by Netaji Subhash Chandra Bose. Netaji’s movement in the form of guerrilla warfare got suppressed by the joint efforts of the Indian and British capitalists with the kind assistance of the revisionist Congress party; Netaji’s struggle shook and challenged the basis and legitimacy of the British imperial rule. The Bengal Famine in 1943, again due to imperialist policies, was instrumental in creating a condition that helped India in gaining political freedom. But the aim of purna swaraj or complete independence, as was imagined by Com. Bhagat Singh and his comrades, is yet to be fulfilled through the complete social and economic emancipation of the Indian toiling masses. Since the achievement of political freedom, Indian capitalists with their allies searched for suitable opportunities for themselves which made the workers suffer. Finally, from 1989 onwards, each and every governmental effort was made by the Indian capitalists for the better-living of the Indian capitalists and for the increase of their profit without paying any heed to the needs and demands of the workers and peasants. For that very purpose, they started taking policies like the so-called Green “revolution” (a myth created BY the bourgeoisie and FOR the bourgeoisie) from the early 1960s which led towards nothing but the blind exploitation of nature and the destruction of the lives of the agricultural workers. The development of a free-market economy in India through the introduction of neoliberal policies reflected whither the wind blew from that time. This ‘wind’ has now taken a more dangerous and regressive direction. As a reaction against the neoliberal order-of-things, neo-fascism is growing at a decisive rate. At such a time and under such a condition, majority of the “Communist” parties in India are being led by faulty ideals, and therefore are still unable to get rid of this grave situation in any way. They could have struck a definite blow quite earlier, but the problem is that they consider the growth of their counter-revolutionary bureaucracy INSIDE the bourgeois-democratic structure far more important than the organization the working class for the socialist revolution, which has been the chief aim of the communists around the world since the birth of scientific socialism. Their apathy is actually helping the neo-fascists in one way or the other. This present onward march of the reactionary neo-fascist forces can be observed all around the world as an effect of the existing economic depression caused by neoliberal globalization. India is now governed by the neo-fascist power which believes in consolidating its fascist autonomy by using communalist and fundamentalist politics. The menacing use of communalism and fundamentalism by the fascists is targeted towards dividing the Indian toiling masses. They use those anti-humanitarian methods to alienate the mind of the people from the actual existing problems. In today’s India, rational-minded free-thinking is a punishable crime in the eyes of the neo-fascists! They are spreading hatred and murdering common people in the name of their so-called “nationalism” — a “nationalism” that is inspired by the ideology of Hitler and Savarkar! Vinayak Damodar Savarkar was the man who became a pro-imperialist for his own vested interests. He was a man who believed in creating a “Hindu Rashtra” (Hindu State) that is quite similar to Hitler’s idea of an Aryan world. Hitler murdered the innocent Jews as well as the communists to defend his fascist ideology and the modern supporters of Savarkar, the ruling neo-fascist class of India, murder innocent Muslims, atheists, the so-called “lower castes” and the communists to defend their ideology based on religious grounds! It is important here to note that Savarkar begged to the British imperialists for forgiveness while he was undergoing a sentence in Cellular Jail, Andaman! Religion, quite obviously, is again serving as one of the greatest allies and supporters of the exploiting class. Its irrational theories are callously supporting the oppressive demands of the puppet ruling class. In a word, it is greatly helping the actual masters of the universe by destroying the revolutionary solidarity the masses. On 10th March, 2017 the Gurgaon sessions court acquitted 117 workers and convicted 31 workers in the sensational Maruti Suzuki riots case, including all the main office bearers of the Maruti Suzuki Workers Union. The quantum of punishment differs: 13 workers were sentenced to life imprisonment, 4 were given 5 years imprisonment and the remaining 14 were let off with what they had already served. With the trial coming to an end after nearly 5 years, this is as good a time as any to take a look back on the critical moments that have marked this case and the lives of the 148 arrested workers – most of whom spent over three long years in jail, even as their lives fell apart around them. 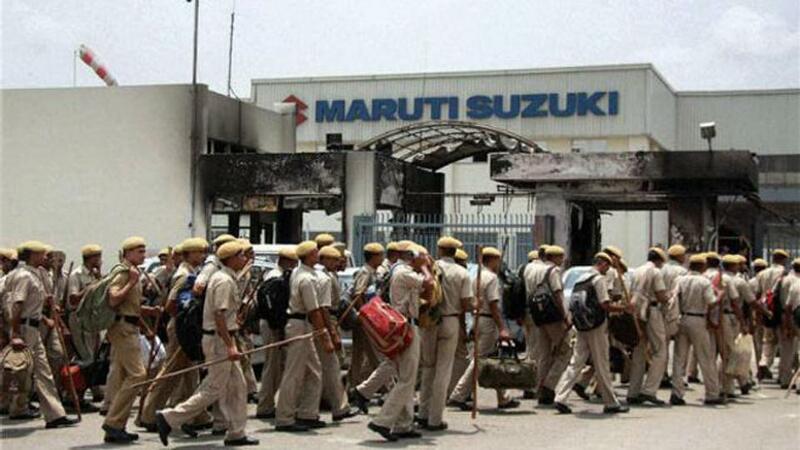 An altercation on the shop floor between a floor supervisor and Jiya Lal, one of the approximately 1500 permanent workers at the Maruti Suzuki Manesar plant, led to the suspension of the worker. While the management alleged that Jiya Lal had assaulted the supervisor, the workers on floor maintained that the supervisor had abused Jiya Lal with casteist slurs. The union began negotiating with the human resources team at the plant. It is alleged by the management and the investigation that when the negotiations broke down without a compromise, violence broke out with workers attacking the staff, including senior officials, with iron rods and other objects. The workers strongly object to this position and claim that a lot of private security was already present inside the premises and they instigated the violence. In the melee, fire broke out in the campus and gutted down a section of the factory. The General Manager (HR), Awanish Kumar Dey, lost his life and about 90 others were treated for minor injuries. To combat this state of affairs, class consciousness is the only possible solution. On 10th March, thirteen struggling Maruti Suzuki workers were given life imprisonment by the Indian bourgeois judiciary for demanding equal rights and justice. Farmers’ suicides in different parts of India continue in great numbers which threaten the future of Indian agriculture. Moreover, the recent joint protest by the exploited farmers of Tamil Nadu in the streets of Delhi clearly indicates the degrading social, political and economic condition of India. The corporatization of the education system along with the rise of caste and religion-based discrimination in India projects the manifestation of injustice due to imperialism, the highest stage of capitalism. The anarchy inherent in the capitalist mode of production is the root cause of this gross injustice. The Indian far right state is employing its “security” forces to guard moribund capitalism against all those who raise the demand for the rights of the deprived people of Kashmir and Manipur for self-determination; it is using barbaric methods in the name of “law and order” (bourgeois prejudices!) against all those who are raising the demand for an exploitation-free society. Most of the laws with which the country is governed today are laws that were introduced by the British imperialists many years ago for the purpose of furthering their own colonial interests. Therefore, the same exploitative system is continuing till now with the same centre-periphery relationship (result of massive colonial hangover!). That is why, today, when we look at the increasing rate of misery of the Indian working class, we feel as if we are re-living the colonial times! Farmers from Tamil Nadu have been protesting in Delhi for weeks over drought relief. Farmers protesting at Jantar Mantar call off strike for 15 days, Chief Minister had assured farmers their demands will be met, Farmers have been protesting for six weeks over drought relief. Farmers from Tamil Nadu have called off their strike in Delhi for a month over a drought relief package after an assurance by Chief Minister E Palaniswami today. Mr Palaniswami had met the farmers who have been protesting at Delhi’s Jantar Mantar for the last six weeks. The chief minister assured the farmers that their demands will be met and urged them to call off their protest. The move came after Mr Palaniswami met Prime Minister Narendra Modi today and highlighted the farmers’ issue. He had also discussed the issue with Finance Minister Arun Jaitley and Home Minister Rajnath Singh. The farmers’ union said if their demands are not met by May 25, they will resume their strike. Mr Palaniswami, who arrived in the national capital yesterday, attended the NITI Aayog meeting along with chief ministers of other states. The protesting farmers have been demanding a Rs. 40,000-crore drought relief package, farm loan waiver and setting up of the Cauvery Management Board by the centre. Over the last 39 days, they have shaved their heads, halved their moustaches, held mice and snakes in their mouths, conducted mock funerals, flogged themselves and even carried skulls of other farmers who had committed suicide due to debt pressure. Earlier this month, dozens of protesters blocked all six lanes of Chennai’s arterial Kathipaara flyover by tying an iron chain to the poles on either side to express solidarity with the farmers protesting in Delhi. The Madras High Court, too, had directed state government to expand its farm loan waiver scheme to include farmers who own land over five acres. However, there is no relief for those who have borrowed from nationalised banks. The state had sought Rs. 40,000 crore from the centre, which sanctioned only Rs. 4,000 crore. With 60 per cent deficit in rainfall, Tamil Nadu witnessed its worst drought in 140 years. At this stage, only socialism can save humanity from the path of destruction. If we are to survive and prosper as a species, we must get rid of imperialism (the highest stage of capitalism) at any cost. The Indian toiling masses must learn to organize themselves on a class basis by shunning off the differences imposed upon them by the bourgeoisie for their own benefits. The proper and effective utilization of the ongoing class struggle is supremely necessary. The working people must try to adopt themselves to an internationalist mindset by understanding the common enemy and the common aim of the world proletariat. In India, only the working (industrial proletariat + agricultural proletariat) class movement led by the progressive and radical youth would be able to check the rise of fascism, that is, moribund capitalism. A radical change, that is, a global socialist revolution is the only need of the time. “That the emancipation of the working classes must be conquered by the working classes themselves, that the struggle for the emancipation of the working classes means not a struggle for class privileges and monopolies, but for equal rights and duties, and the abolition of all class rule.” — Karl Marx, General Rules, October 1864, The International Workingmen’s Association. This May Day, let us try to rationally understand the graveness of the situation and redouble our efforts towards fulfilling the magnificent goal which we all espouse.